The 787 Dreamliner could be taken on by major airlines in the UK in the next few weeks following the grounding of the whole worldwide fleet earlier in the year. Problems arose when battery smoke emerged from two flights run by a Japanese carrier, with the resultant grounding of the fleet coming as a big setback to several UK-based companies. For instance, Thomson wanted to run the Dreamliner from May 1, with eight of the planes having been set to run routes to Mexico and Florida, from Glasgow, Manchester, Gatwick and East Midlands airports. And British Airways had expected 24 of the planes to be delivered next month. Now US aviation authority the FAA has given permission for the Dreamliners to start service again and for a resumption of deliveries. Safety problems in the world of aviation come as a reminder for holidaymakers to check they are covered by worldwide travel insurance. 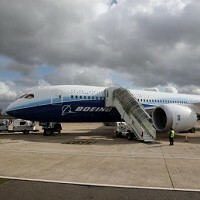 The improvement work on Boeing's new flagship ultra green aircraft should mean the guaranteed safety of the plane, said Larry Loftis, the company's 787 programme vice-president and general manager. However, he said the root cause of the battery failure might never be known.